Sometimes I yearn for the blogging ‘good old days’. When an outfit post was just an outfit post, my inbox was empty of press releases about Kim Kardashian and things like affiliate links, sponsored posts and articles titled ‘How to Monetize Your Blog’ didn’t exist. I’ve been a little bit absent lately, mostly due to travelling, weddings, meetings, work, work and work. But also because writing a blog post can seem like a gargantuan task sometimes. It’s nice to just sit down with some pretty basic outfit shots and write about what’s happening, so that’s what I’ll do. In these photos I’m wearing my current go-to outfit. According to the British weather it’s October, and all the pretty bits and bobs I’ve been saving for the sunshine are yet to be worn. So it’s back to my failsafe printed tea dress, a lightweight parka and these amazing ankle boots – I’ve been wearing these Valensi boots (and the suede version) non-stop since they arrived at my door. They’re perfect with short dresses and bare legs for that ‘fashionable festival’ look, plus they keep my toes dry when it (inevitably) chucks it down. Love. Them. Unfortunately my lovely tan (part USA sunshine, part Garnier Summer Body Gradual Self Tan) has faded away to nothing, so you get to gaze upon my pasty white legs. Sorry about that! I like keeping things simple, I like simple posts, and your outfit looks great! The dress is so cute, love the necklace too! I do like a simple outfit post. A jacket like the one you’re wearing here is something my wardrobe lacks… must remedy that. Blogging is always going to be what you make of it, though I miss basic blogging too sometimes. You look lovely! I love the parka jacket, such a stape piece. This outfit does have a very festival chic look about it! 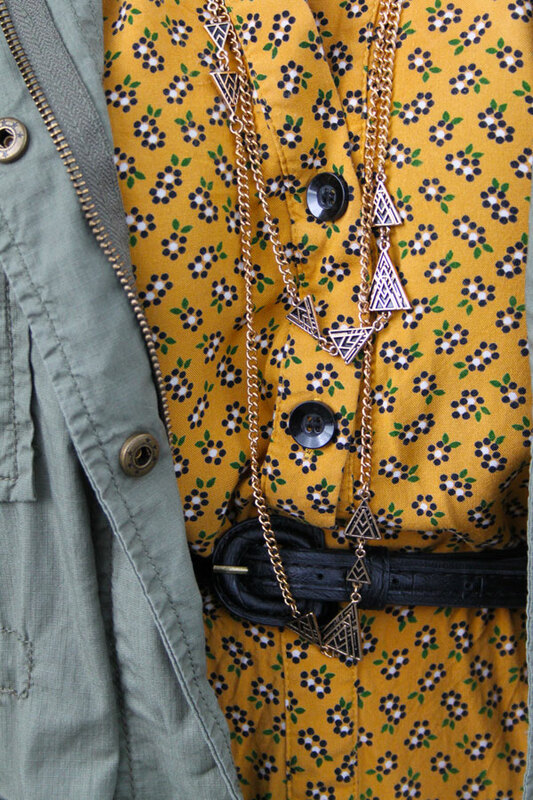 I love the print on the dress and the cargo jacket. I always find blogging in the summer is made easier by the long evenings and more daylight for taking pics but more difficult by the fact that there’s so much more happening and fun to be had so time is scarcer! I love the dress, and the colour of your bag is lovely! I love your outfit, and totally agree about going back to basics – sometimes it’s easy to get swept up with things and forget what you loved about blogging in the first place. I often do these kinds of posts – seeing peoples style was what drew me to blogging in the first place. The jacket looks awesome with the mini dress. Ahh October weather indeed! 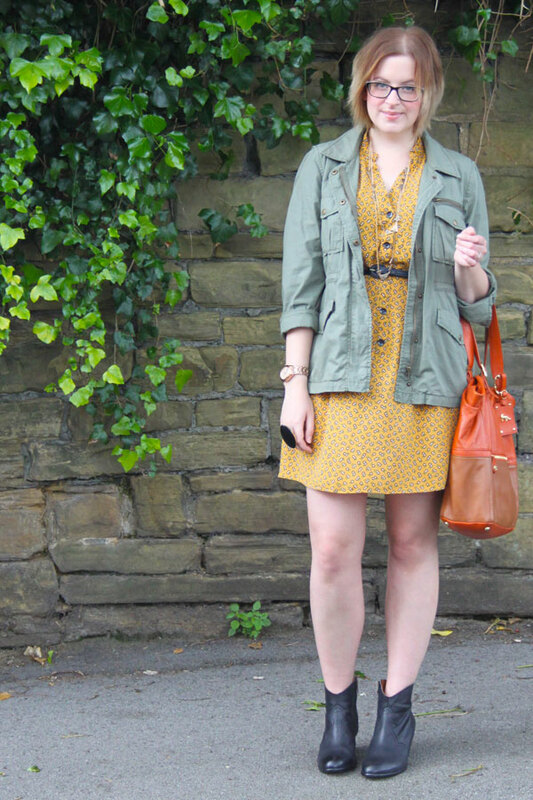 Such a cute dress and you can’t go wrong with a army jacket! They literally go with every outfit. You always have the best accessories as well! Lovely outfit, I really like it. No one expects a tan, and I’m taking advantage of the crap weather to stop shaving my legs! (If the sun makes an appearance I’ll grab the veet strips first, don’t worry). In the brief summer that we had a few weeks ago, I got a weird tan pattern on my legs. On the one hand I want to show my legs off because, look, tan! But on the other hand, part of my leg is still inexplicably white. Which does make the tanned bit look all the more tanned I suppose. I just bought some gingham shorts from Matalan, wish I could wear them before my weird tan fades completely. Sigh. That dress in all its glory looks so wonderful on you, I hope that it stays happily in your closet for a long time coming! And don’t you worry about pale legs- pale is the new tan! I love this kind of outfit, the parka jacket is perfect, and the print of the dress is great. Hair is also looking fab Jen. Fantastic pictures! You look sooo beautiful and this dress is perfect! Just by chance I took a look at your blog and really happy to see you wearing a dress that I have! You wear it well and accessorise it much better than me!